Oxwall 1.3: Private Groups, User Block, Invite Friends, etc. The long awaited Oxwall 1.3.0 is finally here after extensive quality and beta testing. A huge thank you goes to all the testers for their participation. 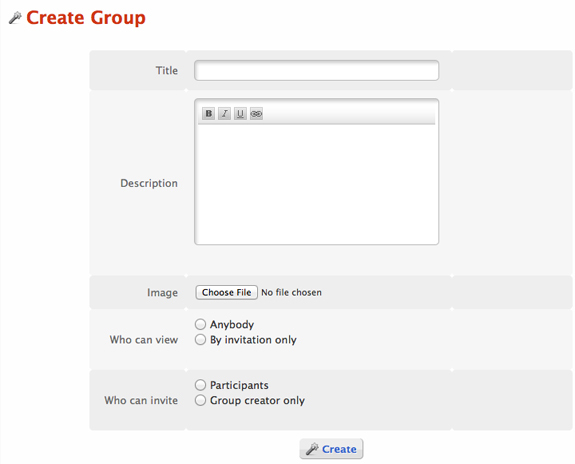 This new plugin allows users to create Private Groups, invisible to others. New members can be invited either by admins or by other group members. Admins and Moderators can now create Private Forums for specific User Roles. Users can now block each other. Once blocked, a user will no longer be able to send IM/PM, become friends, follow and add comments to content of the block initiator. Blocking a user will immediately sever all Friendship and Follow links. We’ve completely revamped Invite Friends feature, which is now compatible with new Facebook and Google APIs. User roles can now be selected for mass mailing. WYSISYG editor was replaced by simple text area for mobile devices. We’ve added an additional step to confirm unsubscription. Maintenance Page login link was added for easier Admin access in case the page needs disabling. The system no longer sends two emails at once – instead it sends a Verification Letter first, and then a Welcome Letter after the verification. Issue with incorrectly displaying full-size attached pictures in Google Chrome fixed. Events End Date completely reworked to appear after check-box is ticked. Variables can be added to the Subject now. Minor improvements for these pages management through the Admin Area. To prevent any questions regarding the Auto Update – it will appear in your Admin Area within 24 hours after the launch of the update. We hope you like the new release. Do tell us what you think in the forum or in the comments bellow. This entry was posted in Development, News, Release and tagged 1.3.0, news by Zima. Bookmark the permalink. Looks like you still have some plugins that require updating. Remember, after you update your platform, you need to update ALL of your plugins as well. The error might appear if you have even one not updated plugin. Looks like the problem is with the init.php file in Newsfeed module. Remove the line no. 67 and see if it works. None of my plugins are showing they need updating…After updating platform core it went a 500 internal server error. I then updated all the plugins that showed they needed updating..still 500 server error..Then from reading the forum i realised people were having problems with the groups plugin and newsfeed plugin..I didnt uninstall the groups plugin as it said i would loose all data but the groups works fine for me only the newsfeed plugin causing a problem…I noticed some said they renamed the plugin folders and got things to work, but im not confident in what i would be doing.. I installed 1.3 and everything is working fine. Thanks a lot for the new version. While sending the mass emails after clicking the submit button, it is showing the following error. Please let me know hoe to solve it. Thanks for the report, we are on it. You are welcome. Looking forward for your solution. Thank you for new version. I hope that Oxwall can have more clear work and relations in future versions and pay more attention to users suggestions. Unfortunately I’m still getting the 500 error, no matter what I try. The admin area is also giving a 500 error.. can i manually disable the plugins? How do I assign someone to a default ‘member’ group after they have been verified? Do you mean User Roles? The default ones are set up under Admin Panel/Users/User Role. Hello everyone at Oxwall… I would like to say, GREAT update… both took place with no problems. Haven’t gotten started on the groups yet to try them out, sadly, all interest fizzled out and hopefully we can rekindle it down the road. In either case, thumbs up. Now… this is something else I’ve noticed and I can’t help but wonder is it in the works. On “My Profile” – WHY is it that I and others can post on my wall, BUT – no comments can be made from there? Nor anyone elses Profile page? So – uhhh, is there anything to come down the road… where I can set everyone to come into the site on their own Profile page, instead of the MAIN – where everything ends up? See, the problem is… topics, threads get lost in the Main – as new comments there push other comments made further down until they disappear from the first page. IF everyone commented on their on WALL in their Profile – the topics they make wouldn’t disappear IF their “Friends” come comment on them from their Profile instead of on the Main page. Just a thought… it would be nice. Again however… back to the thumbs up for the works already done… brilliant! Yes, but this is sort-of a log of a user’s activity on the site, so whoever looks at it can get all the necessary information on the user. The entire activity and activities of friends and followers can be found under Newsfeed User Dashboard. Emmm, yes I know… but still, not the same. Also, when someone posts on something you started or commented on, it would be nice if notification of that new comment/reply came in the email as well. Many times I wished that there was a notifier of replies and comments, because some have been placed, @MKeyes – and I never knew it was there, so the answer from me didn’t come until days later, even up to a week… because other members came in, made a new topic – which sent the one I was mentioned on… down the page. Anyway… just thought I’d toss these couple of suggestions in… I know it’s not simple as 1, 2, 3, building a social community like this. Regardless of my further desires, I simply love it… great job thus far!!! I cant seem to see the new features of group on my oxwall 1.3.1 fresh new installation from my webservers built in installatron. please advice is something wrong with my version? i tried downloading the groups of from the market to update it but after doing so the show site displays error ” http://ilearning-centre.com/resource/500.phtml ” Please advice. Please report this on the troubleshooting forum. I need someones help that is really good with Databases. I want to move the entire site to my new C-Panel hosting but I’m really not a great programmer or have any experience with Database migration so if there is someone that can walk me through it step by step (like I’m a tard 🙂 or even just do it for me that would be way cool. Hi. I have activated the Facebook connect, and it works fine as far as joining the site and logging in is concerned. However, the “Invite Friends” function does not seem to work. When I click on the Facebook icon, it does open the dialogue box, and I am able to select friends. However, after clicking on invite, the box disappears and the Facebook contacts do not receive any notification. Is there something that I am doing wrong here, it terms of configuration etc ? Please visit our forum for more direct support.